Climbers everywhere should take a look at Wesco's 16" inch redwood Highliners. Whether you are a lineman climbing an electrical pole or a brave, adventurous soul out in the wild, these tall boots will stand you in good stead with a quality build not easily surpassed. These redwood boots are not only stylish but practical. With a 100 Vibram lug sole, you will have a much easier time navigating those treacherous areas and keeping a firm foothold where you stand. 16 inches of pure seven ounce full-grain leather separates your legs and feet from the hazards of the environment around you. Remember when you were a kid and climbed trees all day? Your shoes would slip in those tight places, and you'd have to be very careful that you didn't hurt your foot on those sharp branches? You won't have a problem there with these stout boots. 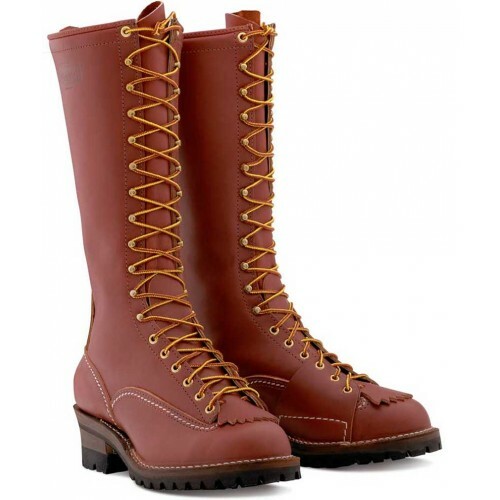 These boots also work to prevent foot pain by coming with a non-corrosive, slightly arched, steel shank, which supports the weight you put on it better than a standard boot. There is even a leather slip added in for a little extra support in your arch. Linemen have a lot of problems they face when climbing electrical poles: climbing spurs being one of them. Wesco intends to help out by adding a recessed metal heel breastplate to these boots, which offers protection from spurs. Ultimately you can't go wrong with these boots if climbing is in your blood. Whether you do it for fun or work, these tall, redwood beauties are designed with your comfort and safety in mind. If black is more your style, check out the 16" Highliner in black. Steel Sideplate not available with 100 Vibram lug sole.